The Equal Concept is derived from the Comparison Concept . It compares two or more fractions, decimals or percentages, etc that represent equal quantities. In this concept, we first draw a model to represent the first variable given and mark out the part of it that will be equal in quantity to a given part in the second variable represented by a second model. 1/4 of A is equal to 1/3 of B. A is greater than B by 40. What is the value of A and B? 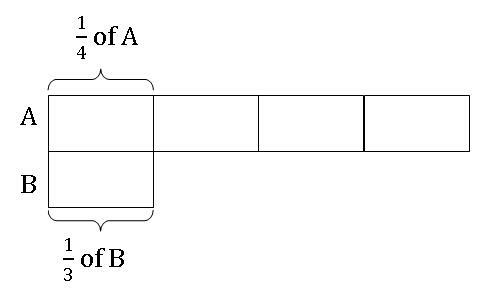 Step 1: Draw a long bar to represent the whole of A. Divide the bar into 4 equal boxes and label 1 box as the equal part. 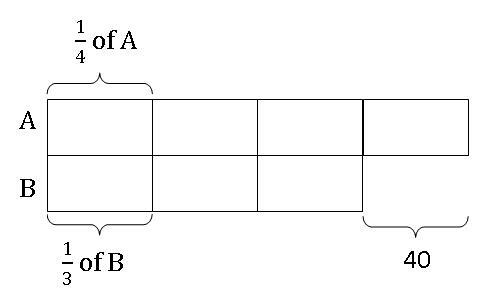 Step 2: Next, draw a box below the model of A to represent the part of B that is equal to 1/4 of A, i.e., 1/3 of B. 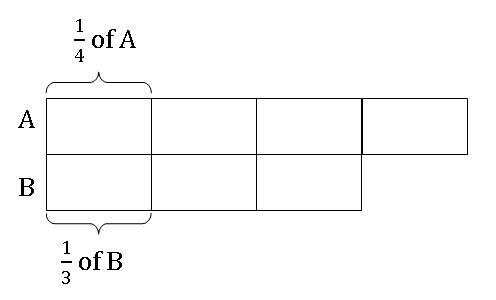 Step 3: Since the first box of B drawn represents 1/3 of B, we will need to draw another 2 boxes to its right to represent the remaining 2/3 of B. Step 4: Since A has 4 units and B has 3 units, the extra 1 unit of A must be equal to 40(given in question). Therefore, A is 160 and B is 120.